Chandeliers are showstopping pieces, but let's face it--they can be incredibly expensive. 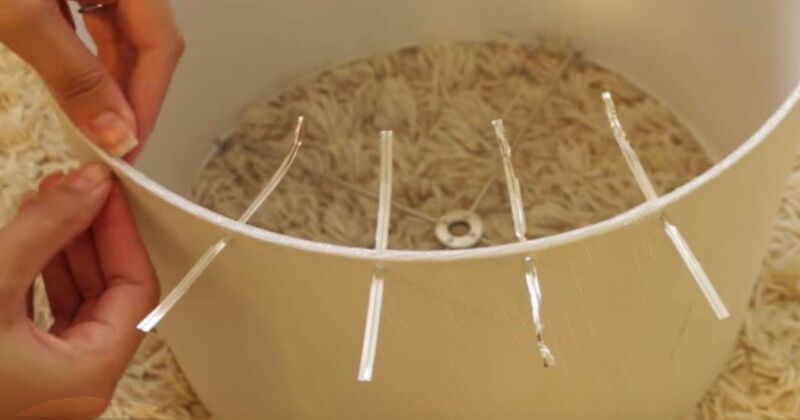 However, with a string of lights, a few twist ties, and a lampshade, you can create your very own DIY chandelier. This is a great solution for cutting costs while not skimping out on style. Let's see how it's done. According to Christine Kobzeff, it's all pretty simple. Start with a basic lampshade that is the appropriate size you need for your space. Christine chose metallic twist-ties for her project that blends in nicely with the final product. She also uses an upholster's needle to poke holes every 2-3 inches around the shade. Christina indicates that you can pretty much use anything so long as it is sharp enough to penetrate the lampshade. Once you have the twist-ties in place, it's time to weave the string of lights through. Christine chose a really pretty garland that has lights and crystals.One by one, you should wrap the lights and secure withe the twist ties. If you are attaching more than one string of lights, be mindful of where it connects so that you can hide the plug-in. Finally, you are ready to hang your creation! Christine suggests purchasing a light socket that has electrical outlets so that you can plug in your chandelier lights. After all, you don't want a long cord running from your wall to your ceiling! You should also attach an extender so that the chandelier hangs 6 inches from the ceiling. Flip the switch, and all of the lights will illuminate. Stunning! Christina Kobzett maintains a blog, Modern Bohemian Lifestyle where she discusses all things eco-chic and gives tons of advice on decorating and DIY solutions. Love this idea? Check out the video for a total breakdown of how to make your very own DIY chandelier, plus many more projects you may enjoy! Share with your friends.